Andrew P. Bodnar faces more than 11 years in a federal penitentiary after he pleaded guilty to charges of securities and mail fraud, conspiracy to commit fraud and tax evasion. The 49-year-old former Akron financial planner and lawyer apologized in court but he couldn't face any of the people who he defrauded of $41 million in a Ponzi scheme which he ran from 1994 to 1998, where he sold securities, including so-called promissory notes, to investors in Ohio and Maryland. Money from later investors was used to pay off initial investors and also to buy homes, pay mortgages and car loans, and pay for golf club memberships and other lifestyle enhancements by him and others in the firm. Three other men who worked with him, including former Wadsworth Mayor Anthony P. Perry, were sentenced to prison earlier this year. Though ordered to make restitution of $20 million it's unlikely he has any money to give back, officials said. For while some believe Bodnar has a stash of money somewhere his lawyer contends his client does not have any money to repay the defrauded clients because a lot of the money was spent repaying original investors. "He knows where all the money is," said Beverly Kleinholz, who was among the somber-faced audience members. Though she and her husband successfully sued Bodnar, they haven't been repaid the hundreds of thousands of dollars they are owed, she said. A court-appointed receiver has returned about $1.3 million to 600 investors, representing about 6 cents on the dollar. In pleading guilty to new charges of tax evasion, prosecutors said Bodnar filed tax returns saying he made $287,515 from 1994 to 1997, while failing to report more than $1.8 million in additional income. Nancy Trousdale, 51, who faces up to 10 years in prison if convicted of helping scam 121 investors out of $3.7 million in a Ponzi scheme reached a plea agreement in which she will confess to a single charge of securities fraud. Trousdale, owner of Nancy Tours, was indicted on 313 counts of criminal wrongdoing, including 169 counts of securities fraud and 100 counts of first-degree theft. However, after she pled guilty to 85 counts of a Grand Jury indictment for her actions only the charge of securities fraud will stand under the plea agreement which also forgives the involvement of her son and daughter-in-law. People from Alabama and Tennessee invested money in a company called Travel International which promised that their investment would double in 30 days. She and her associates told the investors they were buying tickets for cruises and sporting events at a huge discount. Designed as a Ponzi scheme, the result was that a few investors made money and the rest lost millions. Overall, more than 200 investors put in $7.4 million of which 121 of them lost $3.7 million over three years. Trousdale was placed into immediate custody and sentenced to 12 consecutive years of imprisonment and ordered to pay restitution of over $3.7 million dollars to victims who invested in her travel ticket venture. For his cooperation with authorities during the investigation, Donald Trowbridge, a partner in the venture who pled guilty, was sentenced to only six months in a work release center and ordered to pay over $2 million in restitution to victims. (Portland, OR 10/01) - Jeffrey L. Grayson, the Portland investment manager accused of bilking his clients out of hundreds of millions of dollars, pleaded not guilty to 22 counts of mail fraud, witness tampering, conspiracy, money laundering and making illegal payoffs to John Abbott, a former union pension fund trustee for whom prosecutors are seeking a 15 month sentence. Grayson entered his plea thirteen months after federal regulators shut down his company (9/00) and accused him of running a Ponzi-like scheme to conceal the fact that Capital Consultants lost an estimated $355 million of its clients' money in failed and allegedly fraudulent investments. After spending $328,747.63 so far on legal fees, victims of Capital Consultants' failed investments argued that every dollar spent on his defense will mean one less dollar returned to investors. Barclay Grayson, his son and former president of Capital Consultants, pleaded guilty to mail fraud and agreed to cooperate with prosecutors in return for an 18-month sentence. In the fall of 1998, the SEC filed a lawsuit against Robert Cord, Funding Resource Group a/k/a FRG Trust; MVP Network, Inc. a/k/a MVP Network (Trust); FMCI Trust; Funders Marketing Company, Inc.; Fortune Investments, Ltd.; Winterhawk West Indies, Ltd.; IGW Trust; which were accused of violating various securities laws by engaging in alleged high yield investment schemes which were, in actuality, nothing more than elaborate Ponzi schemes. A criminal forfeiture seized various funds, real property, cars, boats and other property belonging to Robert Cord and his various entities. In connection with his role in running the scam, he pleaded guilty to mail fraud. On 11/24/99 the SEC got a temporary restraining order to protect its ability to recover over $16.5 million raised from approximately 625 investors in the fraudulent securities scheme run by Cornerstone Prodigy Group, Inc. and its principals Gary D. Reeder, a convicted felon with numerous offenses, including forgery, theft and burglary, and Sandra Reeder, a licensed securities professional. Executive Netprofits, Inc., a Texas entity owned and controlled by them was listed as a defendant solely for purposes of equitable relief. Cornerstone's scheme involved sales of investments through its website, cold-calling of potential investors, and the payment of cash for investor referrals. They promised that funds would be pooled and used for various business operations which would generate enough profits to pay investors a 10% monthly return which was in fact paid out by check for a period of time. They touted a "100 percent success ratio," which as a ponzi scheme it had, as long as funds of recent investors were used to make purported profit payments to earlier investors. This encouraged many more of the elderly victims, who hoped to supplement their retirement income, to increase their investment, often through the use of credit card payments, which were promoted. On April 14, 2000 a U.S. District Judge entered a Permanent Injunction which enjoins Cornerstone and the Reeders, who, without admitting or denying guilt, consented to the issuance of the order, from future violations of the anti-fraud and securities registration provisions of the federal securities laws. The Court also ordered them to disgorge $16.5 million, less the approximately $6 million of investor funds recovered to date by a receiver, but waived the balance based upon their demonstrated financial inability to pay. Despite the original settlement, most Cornerstone customers recovered only about 47 percent of their original investments, likely leaving them short of the funds needed to purchase the jewelry now being sold at the new site with the logo of the original operation. (Australia 05/01) After the judge commented on his ruthless arrogance in dealing with people and their money, Geoffrey Robert Dexter was given a 10-year jail sentence after being found guilty of inducing people to invest in the Wattle Group investment scheme on the basis of false pretences, willful false promises and dishonest inducement. He was also banned as an adviser and declared bankrupt. The Wattle Group investment scheme had around 2,700 investors across Australia and raised in excess of $160 million prior to being shut down in March of 1998. Investors were told they their funds were loaned on a short-term basis to provide a return of up to 50 per cent. 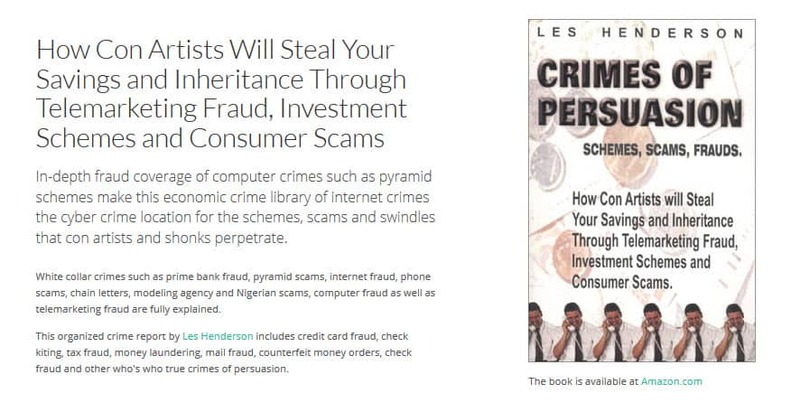 Instead, it was a 'Ponzi-type' scheme that paid interest and refunds to investors entirely out of the incoming funds of new investors entering into the scheme. the banning of 10 investment advisers, for periods of between 1 and 5 years, who were involved in the scheme. In August 2001 accountant Barry Alan Elms was banned by the Australian Securities and Investments Commission (ASIC) from acting as a representative of a securities dealer or an investment adviser for three years. He managed to bring about $4.25 million into the failed Wattle Group investment scheme as well as offering investments in an unformed company, Future Mortgage Holdings Limited, where he and his partner were trustees. That company was ultimately wound up with no return of funds to investors. 03/00 - The SEC obtained judgments against all five remaining defendants in this investment fraud case filed in 1998. Susan and Charles Browne, of California and New Mexico, formerly owned and operated Alliance Leasing Corporation which raised over $46,000,000 from more than 1,500 investors throughout the U.S. through the fraudulent sale of unregistered equipment leasing investments. they owned or controlled many of the companies to which Alliance supposedly leased equipment. The Court also ordered them to disgorge $477,467 (plus interest) of their ill-gotten gains to investors and pay a matching civil money penalty of $477,467 each. The Court also entered judgment against Prime Atlantic, Inc., and its owners, David Halsey and Braccus Giavanno, of Jacksonville, Florida for running the sales organization that sold the unregistered Alliance investment to individuals in return for an undisclosed 30% commission. They were ordered to disgorge (plus interest) as follows: Prime - $12,182,820; Halsey- $1,615,999; and Giavanno - $1,691,011. The Court also ordered Prime to pay a civil penalty of $500,000 and Halsey and Giavanno to pay a penalty of $100,000 each within thirty days. In addition, the judge ordered that more than $22 million in Alliance and Prime bank and brokerage accounts be frozen, most of which was distributed to investors by the Chapter 11 trustee. Subject: How you can make 45% per year paid quarterly ! Investor Alert ! ! Make 45% Fully Secured! Learn how you can make 45% paid quarterly in advance factoring commercial Accounts receivables. Contact us for your "FREE" in-depth information package. Look into how you can get a return of 45% paid quarterly in advance and "Fully Secured". (11/25/01) BRADY, Texas – At 28, Brian Russell Stearns, was, by his own account, self-taught in the esoteric world of international finance. Residents of Brady, a ranching town of 6,000, now acknowledge that they never understood precisely what it was that Mr. Stearns did for a living and at least a few admit that greed may have obscured their common sense. Stearns' own explanation was disjointed and complex. He portrayed himself as a man who had taken only a few college courses, but who nonetheless had engineered multimillion-dollar packages for insurance companies and even the Pakistani Air Force. His financial contacts, he boasted, ranged from Hong Kong to Poland. What was obvious, though, were the lavish symbols of his success. He would show up at his girlfriend's parents' in chauffeur-driven limousines and sometimes shuttled into town in a helicopter or a Learjet. A $2.2 million Mediterranean-style villa overlooking Lake Austin was his gift to his teen-age bride. Soon the story circulated around town that her parents had pooled $125,000 from the recent sale of their home with another $81,000 they borrowed and invested it with their new son-in-law. Eleven days later, Brian Stearns wired $1,029,377 – a 500 percent return – into their bank account. Then her aunt and uncle and a handful of friends invested $250,000 with him, and raked in $947,840 – a return of nearly 400 percent, in a little over a month. As word of this spread, people from all walks of life – more than 350 people all told – dipped into their savings, cashed in their pension plans, and borrowed against their houses. Of all these hundreds of people who invested, only about ten had ever met him. A few of the initial investors made staggering profits, which naturally gave him credibility. Inevitably though, virtually everybody who made money from the first deal gave it back to Stearns for reinvestment. He flew prospective investors to Las Vegas and other places in a private jet or helicopter. Around Austin, he chose from a Lamborghini Diablo, two BMWs, a Mercedes-Benz SL600 convertible, or a Toyota Land Cruiser. There were other props, too, that convinced people. Using a computer supposedly linked to the Bloomberg financial network, he showed a prospective British lender that he owned a $40 million Federal Home Loan Bank bond, which he offered for collateral. He also produced a copy of a brokerage house's account that showed he had access to Barclays Bank bonds worth $2.3 billion. Neither, the FBI discovered, was remotely true. According to confiscated bank records, it was proceeds from a $20 million loan by a British corporation, Ivor-Wolfson, that paid the initial investors the staggering profits that triggered the investment whirlwind in Brady. But those earlier returns weren't from investments. Indeed, there were no investments. The "profits" were actually funds contributed by other investors who ultimately were destined to receive nothing. Soon, this town's $4.7 million, along with another $45 million taken in from presumably sophisticated international investment brokers from Canada to Great Britain and the Channel Islands, vanished. Brian Russell Stearns was ultimately convicted of 82 counts of fraud in federal court and sentenced to 30 years in federal prison and ordered to pay restitution of $36,054,990 – the money still unaccounted for after the government seized all the other assets it could find. While he was locked up awaiting trial, Mr. Stearns stated that investors needed to be patient: He protested that he was worth millions and simple logistical problems accounted for the fact that several hundred people on two continents hadn't received their profits. "You will get the money that is due you. I have never failed on repayment of a loan." The judge in the case quoted from an administered psychiatric report: "Indeed, it seems likely that the defendant generally refrains from resorting to the truth whenever a lie will do." 04/02 -- Four men accused of running an Orlando-based Ponzi scheme that targeted about 2,000 victims and brought in $200-million have agreed to plead guilty to federal criminal charges. Thomas Spencer, 51, and Robert W. Boyd, 55, both of Orlando, created the scheme and agreed to plead guilty to four counts including conspiracy to commit securities fraud, court records stated. They each face a maximum of 30 years in prison and more than $1-million in fines. Spencer and Boyd turned the scheme over to Martin W. Boelens Jr., 45, of Orlando, in 1998. Boelens agreed to plead guilty to similar charges and faces up to 25 years in prison. Boyd and Boelens are attorneys. Anthony V. Micciche, 72, a Tampa-based broker who did not run the program but helped facilitate it, agreed to plead guilty to one count of sale of unregistered securities. Many of the brokers and salesmen who sold the investments apparently thought it was legitimate based on the promotional videos and glossy brochures they were provided with to market the investment. The decade-long scam was set up in 1991 and promised high returns of 10 to 12 percent on "guaranteed," government-backed bonds but instead, much of the money was stolen, and the rest invested in high-risk securities. The men marketed the investments to investors from 17 states and many foreign countries under several names including Evergreen Security and Worldwide Bond Partners Ltd., which took in $35-million in the Tampa Bay area, court records showed. A few of the 2,000 victims invested more than $1-million each while many investors cashed out their retirement accounts to invest with the companies. At first, many investors received monthly payments and often rolled over their investments when the men marketed new investments unaware that up to 70 percent of their money was being stolen and diverted through more than forty offshore entities in the Caribbean and Central America to both hide it from investors and make it hard for law enforcement to eventually track. Like most Ponzi schemes, the incoming money could not keep up with the monthly payments to investors and in the fall of 2000, after checks began to bounce and payments weren't made, Boelens put the company into bankruptcy, which is when authorities became suspicious and an investigation began. The Ponzi Device was also used 2 years ago in Australia by a Geoffrey Dexter of the Wattle Group, who promised better than usual dividends and paid them, from a diverse manufacturing/investment base. It was so good he got in many people, including about 200 mostly country policemen, before the authorities acted. It is easy to offer say 2% per month, and pay it quarterly at 6%, thus 4 times better than bank interest at 24%, and this still leaves the scammer a 76% pure profit ( as he intends to keep it all ) after a year from the first investors, who by then would have told a huge number of friends. This gives you 4 years before the PONZI SCHEME runs out of funds (less postage of course). Then 'legitimize' the theft by issuing false invoices for expenses in a business venture... Get an auditor 'onside'... a 'mate' or 'buddy' as you say..."Now don't you worry about that!" is a fairly famous saying here in Queensland. Thirty-two of us dinki-di Aussies were also 'ponzied' in Sydney NSW when we lost $2 million after investing in a manufacturing operation to exploit an invention, and were paid 'ponzi' interest from our own capital to deceive us that all was well. The interest on subscriptions was logical. Just a refund of interest to the company on unused working capital, and at 12.5% pa not so high at times of 20% interest ~1990. Make exposure less likely...But they were 'nicking the loot', $1 million in all, and without funds to complete the work everything fell apart. As well as overcharging huge amounts using false invoices, they stole small sums from $1,000 up. 06/06/03 NEW YORK (Reuters) - New Jersey said Friday it sued two dozen companies and individuals, charging they swindled hundreds of investors, including best-selling author Mary Higgins Clark, through a phony investment scheme. In a complaint filed in a New Jersey court, Attorney General Peter Harvey accused eight people and 16 firms of defrauding hundreds of investors by "luring" them into purchasing $80 million worth of securities with promises of 15-percent returns. New Jersey officials said in a press statement on Friday that the suit charges that Thomas Giacomaro and seven others used the cash to lease a Mercedes-Benz, a Lexus and Cadillacs for themselves and relatives, and to buy extravagant homes. "We intend to recoup the defendants' ill-gotten gains and to return as much money as we can to the victims," Harvey said in the statement. The statement said that Clark and her family were swindled out of $20 million. Aside from setting up a scheme that involved several security sales to raise money to pay off previous investors, New Jersey said the suit charges the defendants with selling unregistered securities in the state, and also with not being registered to sell securities of any kind. Giacomaro, 50, pleaded guilty Friday to money laundering and is currently serving an 18-month prison sentence for a previous guilty plea, a spokesman for the New Jersey State Division of Criminal Justice told Reuters. 03/06 - An accountant on Monday admitted helping a convicted con man from Saddle River hide millions of dollars in investor money by falsely recording business expenses. Richard Antoniotti, 52, of Hasbrouck Heights told a federal judge in Newark that he knew that the chief financial officer at Wellesley Services LLC routinely directed a co-conspirator to sign checks for funds that would end up in the hands of Thomas Giacomaro. Giacomaro, 51, was sentenced in February 2004 to 14 years in prison for bilking $80 million out of 200 investors, including best-selling author Mary Higgins Clark and senior citizens living on fixed incomes. In pleading guilty to conspiracy, Antoniotti said Monday that CFO Anthony Bianco directed him to record the payments on Wellesley's books as legitimate business expenses -- even though he knew that the checks would be cashed and given to Giacomaro as spending money. Antoniotti also admitted that alleged co-conspirator Peter Dobbins signed checks and authorized wire transfers to pay the personal credit card bills of Giacomaro and his wife, and to buy expensive homes and fund costly real estate improvements for Giacomaro, Bianco and other alleged members of the scheme. Authorities said Giacomaro was secretly helping the FBI investigate organized crime when he headed the multimillion-dollar pyramid scheme, creating businesses that offered exorbitant returns but instead funneled the money to the conspirators. At the center of the scheme was Wellesley Services, which billed itself as a specialist in purchasing small firms in the transportation, trash, courier and fuel oil industries. Antoniotti pleaded guilty to one count of conspiring to defraud the United States and faces a maximum of five years in prison and a $250,000 fine. U.S. District Judge John C. Lifland set sentencing for June 19. 02/04 - Hawaii - A La'ie woman who was accused of being a chief promoter of a Ponzi scheme that bilked about 5,000 investors from Hawai'i, American Samoa, Japan and the Mainland out of more than $66 million was sentenced in federal court yesterday to nearly 20 years in jail. U.S. District Judge Manuel Real, who presided over a jury-waived retrial of Montez Ottley, 57, found her guilty in December of 14 criminal counts including mail fraud, wire fraud, money laundering and conspiracy. Her bogus program promised an 8 percent profit in 13 weeks in exchange for a minimum investment of $1,000. 03/27/04 - A 39-year-old Fremont woman was sentenced Friday to 57 months in prison and ordered to pay more than $2.5 million in restitution stemming from an investment scam that targeted dozens of people, including several local residents. Nimfa Montes Beredo, also known as Patricia Beredo, was arrested last year and pleaded guilty to wire fraud, credit card fraud and money laundering in November. Fremont police learned of the scam in 1998. "We had two victims who called the police saying they were being defrauded," said Detective Bill Veteran of the Fremont Police Department. He said the case was later forwarded to the Fremont police's fraud division, and then the FBI and Internal Revenue Service. Veteran said Beredo worked out of World Destiny Travel in Fremont. On Friday, Beredo apologized for her actions during her sentencing at the U.S. District Courthouse in Oakland. Prosecutors said Beredo had falsely told "investors" -- most of whom were from the Bay Area -- that she had contracted with airline companies to buy discounted air travel tickets in bulk. Scam victims were talked into giving money to Beredo, who promised to resell tickets at a profit that would be shared. She told various investors they'd earn returns of 5 percent per day, per week or per month, but then would use the money to pay off earlier victims. She also convinced some of the victims to provide her with personal information, such as credit card numbers, which she would then use for her own benefit. Beredo has admitted to charging more than $120,000 in unauthorized charges on victims' account. 01/05 - California - Contra Costa County authorities issued an arrest warrant Wednesday for the alleged architect of an elaborate scheme that bilked scores of people out of millions of dollars and cost St. Mary's College a $112 million pledge. Prosecutors charged John Banker, 84, with eight counts of grand theft. Authorities believe he fled to Mexico months ago, and the FBI will issue a warrant charging him with unlawful flight to avoid prosecution. "John Banker was the mastermind behind an elaborate scheme," said Greg Leonard, the Walnut Creek police detective who led the five-month investigation into Banker's alleged scam. "He's a very charismatic man. He involved several high-powered, high-dollar individuals that lent credibility to the investment scam. The pledges to St. Mary's also added credibility." Banker was already in trouble. A Contra Costa Superior Court judge ordered him in November to pay $12.7 million in damages and other payments to Ed Ageno, an alleged victim of the bogus real estate deal who died in 1997. Prosecutors said the scam began that year when Banker and Conrad Colbrandt -- who has been cleared of criminal wrongdoing -- persuaded more than 100 people to invest roughly $8 million in a deal to buy land that would be leased to PepsiCo. St. Mary's never invested in the scheme and PepsiCo has said its name was used fraudulently. However, Colbrandt made a series of pledges to St. Mary's totaling $112 million, prompting the college in Moraga to build a $26 million science facility and legitimized the real estate deal in the eyes of investors. The debacle lead to the resignation of the college president and has forced St. Mary's to scale back its building plans. Colbrandt said Banker duped him along with everyone else. He has since sold his two businesses and is defending himself against two civil lawsuits and expects there will be more over time, said his attorney Rick Madsen. Some investors handed over investments that reached as much as $300,000. Police interviewed about 100 investors but said there may be as many as 110 groups with 200 victims. Most were from the Bay Area but others came from Hawaii, Oregon, Nevada, Colorado, Texas, Indiana and Tennessee, Leonard said. The fiasco may have been avoidable, Leonard said, if people had simply asked more questions and checked with places like the Securities and Exchange Commission as well as some of the owners of property Banker claimed to be selling. "Here's where it was such a great scam," Leonard said. "Banker told everyone that no one should talk to anyone about this because if word got out that these properties were going to sell, it would crumble." Nearly 25 years ago, Banker served three years in prison for fleecing clients in a real estate deal a prosecutor at the time called "one of the largest and most notorious thefts in the history of Alameda County." In that case, he also sold property he wasn't authorized to sell, Leonard said. "Ultimately, I can see how some of the investors got caught up in it, but with due diligence, they could have avoided it," he said. 01/05 - (CNET news.com) - A lawsuit claiming that a "gold backed" Internet currency scheme bilked investors out of more than $250 million can proceed against a bank implicated in it, a federal judge has ruled. At the height of its popularity, the OSGold currency boasted more than 60,000 accounts created by people drawn to promises of "high yield" investments that would provide guaranteed monthly returns of 30 percent to 45 percent. But around July 2002, the eve of the maturity date for the investment program, the company that offered the accounts suddenly ceased payouts. David Reed, who had founded the company called One Groupe International, eventually was discovered to have relocated from the United States to Cancun, Mexico. Concluding they had been fleeced, a group of OSGold investors banded together to sue Reed and 19 other defendants including two Latvian banks that allegedly lent their imprimatur to the project. It was "fronted by the sale of a nonexistent gold-backed Internet currency and was fueled by a mammoth 'Ponzi' scheme disguised as a guaranteed high-yield investment program," the OSGold investors say in court documents. U.S. District Judge Lewis Kaplan ruled on Friday that the lawsuit could proceed against the Latvian Economic Commercial Bank (Lateko), which had attempted to dismiss the charges. Kaplan, in New York, dismissed some charges against Lateko, including breach of fiduciary duty, but permitted the rest to stand. "Lateko's apparently false denials to a possibly important business partner and its continued cooperation with (Reed and other defendants) even after the scheme suspiciously began to collapse tend to show conscious disregard or recklessness and give rise to a strong inference of fraudulent intent," Kaplan wrote. Lateko's involvement began in December 2001, when it allegedly inked a deal with Reed and other defendants to provide anonymous debit cards that could be used to withdraw money from OSGold accounts from ATMs linked to the Cirrus network. Lawyers for Lateko in the New York offices of Baker & McKenzie did not respond to an interview request. Suspecting something odd was going on, some companies involved in providing gold-backed Internet currencies tried to distance themselves from OSGold early on. In May 2001, the Gold and Silver Reserve (responsible for the e-gold currency) announced it would no longer link to companies that did business with "or make reference to" OSGold. COLUMBIA, SC (WIS) - 06/07 - Three men have been arrested in connection with the suspected Ponzi scam. Tony Pough, 45; Tim McQueen, 49; and Joseph Brunson, 43, all of Columbia, are charged with selling unregistered securities. Pough and McQueen were arrested without incident Friday by State Law Enforcement Division agents. Joseph Brunson turned himself in the same day. The three men were named in a restraining order sought last month by the Attorney General's Office. The order enjoined Capital Consortium Group, Inc.; 3 Hebrew Boys, LLC; Tony Pough, Tim McQueen, and Joseph Brunson from liquidating or moving over $17 million in funds from accounts with First Citizens Bank in Columbia. McMaster alleged that the individuals listed above "have violated the State Securities Act by engaging in fraudulent sales practices and by selling securities in and from the State of South Carolina without properly registering them." He says none of the funds raised have ever been invested as originally advertised to investors. Rather, McMaster says that bank records suggest that the money has been converted to the personal use of the defendants. The defendants allegedly targeted churches and military bases in the region, and recruited members to attend large meetings, where multiple investment opportunities were offered. Invest a certain amount of money and then get a 10% monthly return on the money after 91 days. Pay a fee and have the mortgage on the investor's home paid off after sixteen (16) months. Pay a fee and have the investor's credit cards paid off after twelve (12) months. Pay a fee and have the investor's car loan paid off after twelve (12) months. None of these securities have ever been registered with the Securities Division of the Attorney General's Office, nor have any of the defendants ever been registered with the office in order to sell securities in or from the state.